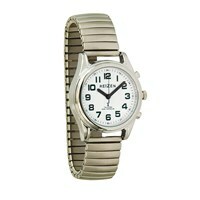 Tel-Time Low Vision Watch for women has a black face with chrome accents. Easy-to-read large print numbers and dashes. Classic and elegant.